Summertime can be a difficult time for a book reviewer. There are stacks and stacks of new books issued for the vacation reading crowd, fat books with short simple sentences and flashy plots that are projected on the mind’s eye like the entertaining summer movies light up the cool darkness of an airconditioned theatre. Much like the salty, buttery popcorn munched voraciously in that chilly darkness, summer books are consumed by the handful. They are fun, often pleasant experiences, but very much like having a constant diet of popcorn or Cheetos, they are rarely filling nor do they leave you with the pleasant feeling of having consumed a real meal. It is such a wonder and delight then to find yourself with a book that is a feast, a banquet for the mind. Painted Horses is just such a book. 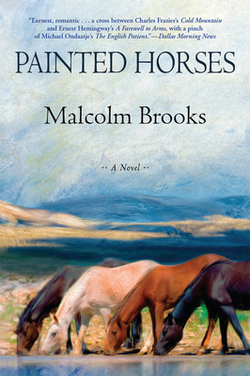 The debut novel of writer Malcolm Brooks, Painted Horses is a combination of polished writing, interesting questions, fully fleshed characters, and a compelling series of interconnected storylines. I rarely, if ever, have felt the need to slow down the speed with which I read, but I forced myself to do so with this book because I simply did not want it to end. The novel centers around two primary characters and their experiences. Catherine Lemay is a very young archaeologist by default. While in London in the 1950s, she finds herself distracted from her studies as a serious pianist by the site of a dig in one of the areas bombed out during the Blitz. Here, the stone remnants of Londinium have been uncovered by the destruction of the modern city built in layer upon layer atop the antiquities. As a result of her interest and constant loitering at the dig, she is accepted by the workmen and eventually by the professors. She abandons her music, and gives her heart to the dig. As a result of the publicity following the uncovering of a pagan Roman temple, Catherine is offered a temporary position back in the United States with the Smithsonian at a site in Montana. She is expected to examine a bleak area of high desert prior to the building of a dam that will flood the area, and document anything of importance she finds. Catherine struggles with her own inadequacies for the position, the attitudes of those who want the dam regardless of any Native American sacred places that might be inundated, and her general youth and inexperience. The parallel story concerns John H., a man who lives in that vast landscape with his painted horse, solitary and mysterious. He was one of the wild boys of the road left homeless by circumstances in the Great Depression, riding the rails until he landed in Montana. There he found a career as a mustanger, a home with a Basque sheepherder, and a place to belong until World War Two called him to the battlefields of Europe. The book details his travels from the beginning as a skinny, hopeless boy, to the damaged man who returned to Montana to heal after cataclysmic losses. Brooks brings these two people together in a story that is part mystery, part history, part social issue, and part coming-of-age story. It resonates with the music of beautiful writing. Brooks must know classical music, because without the reader being conscious of the arrangement, Brooks’ narrative takes on the changes and tempos of an orchestral piece. At times, when the story is focused on youth and adolescent confusion there is a staccato rhythm to the sentences, with an occasional slower passage as the character is introspective. Description are lyrical. The vocabulary has a beauty to it in his descriptions of women, and places, and animals. The portions where he describes the horses that so influence John H’s life have the power and mobility of a cave painting; the words are short, fluid, powerful like the paint strokes of a prehistoric hand. This is no easy book dashed off in a fever, it is a beautiful polished piece of prose. As the books moves towards its conclusion, the tension in the writing becomes almost unbearable, weighted down with a crushing sense of doom. That Brooks is able to put so much emotion into what could have been merely a thriller at this point says a great deal for his feeling for his creation. The book makes serious comments about the need to balance preservation with progress, yet it does not preach. I believe Brooks has a strong future in literature. Painted Horses is not quite serious art, but it certainly stands in the doorway of literature. That it is exceedingly readable makes it a real treasure. I was so sorry to reach the end of Painted Horses. I will look forward to Brooks’ next book, and the one after that if he continues to produce material like this one. I strongly recommend Painted Horses to anyone who loves to read, loves a little history mixed in with their entertainment, a little social conscience mixed in with their adventure. Younger adults will find much to identify with in Catherine, as she struggles to choose between expectations and personal satisfaction, love and career, safety and what is right. Older readers will be drawn along in the heartbreaking experiences in the life of John H., with his unique sense of self and strong inner core. Painted Horses is truly a banquet, with a satisfying course for everyone who comes to its table. I usually like the stories that have two independent paths intersecting, so this one sounds intriguing! I am really interested in how the book explores the feelings of inadequacy Catherine experiences, having had fantasies of completely changing careers, but knowing I could never be experienced enough to do what I wish I could do.